Simple & Sincere: Adding a little color to your day! Here are the last two cards from this month's stamp-a-stack. 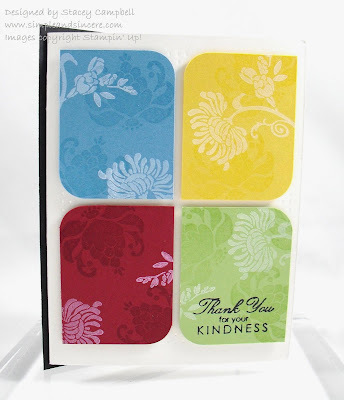 These cards were designed and demonstrated by my downline, Stacey Campbell. She has such a great eye for fun color combinations and layouts. I'm so glad that she is going to be participating in my classes with me! This card uses the new Friends Never Fade set. 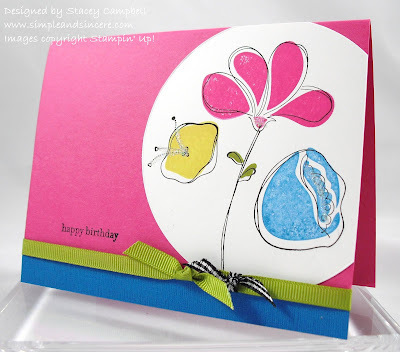 I love this fun, colorful layout - it's amazing what you can do with a couple of ink pads and a corner rounder! I absolutely love this unique color combination - Melon Mambo, Pacific Point, Daffodil Delight and Old Olive. Wow! And look at the centers of the flowers - notice the Dazzling Diamonds? Love it! I hope you have a fantastic weekend ahead. I don't have much on the calendar, and after a CRAZY week of running around, I'm looking forward to some downtime with my family. See you back here next week!